"Honey has many virtues: a symbol of light and sun, an emblem of poetry and science and has been used since Ancient times as a remedy for dry skin and to help heal wounds. This nectar is used in L'Aquarelle Sennelier not only as a preservative but as an additive giving incomparable brilliance and smoothness to the paint. 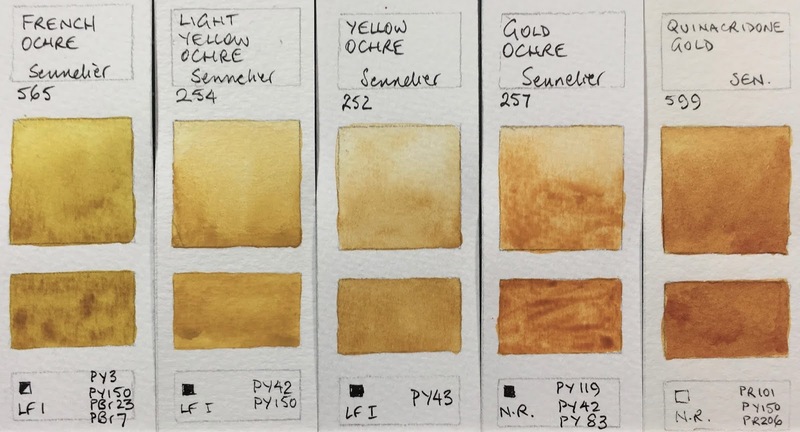 Always striving for excellence, Sennelier has reworked its watercolor formula with increasing the amount of Honey in the paint to reinforce the longevity of the colors, their radiance and luminosity." Unfortunately, honey also makes watercolours stay more runny, so this has made it far more challenging to get hold of samples as they don't necessarily dry enough to be posted through the mail - lots of inventive solutions including using blister packs from chewing gum, contact lenses and tablets have needed to be devised. However they are also available in 1/2 and full pan form, and one of my students lent me her 48 colour pan set so I was able to fill a number of gaps. In March 2019 I was finally able to fill the rest of the gaps and show the full range :-) So here is the Sennelier professional or L'Aquarelle range. There is also a student range called La Petite. The set uses the same palette as Rembrandt, but includes this useful overlay showing what each colour is. The full colour chart can be seen here. There is a Sennelier shop in Paris, opposite the Louvre at 3 Quai Voltaire that is apparently a joy to visit - see the comments below. For those who use watercolours straight from the tube, Sennelier (and M.Graham) tube colours are a possible choice. For those who, like me, use them dried out in palettes, the pan versions are the best options with this range. They rewet beautifully. Here is the 48 colour set open. As always, I have tried to colour-match as well as possible but this is just a guide to the actual colours. Nickel Yellow is often a very weak yellow but this version, while still relatively gentle, painted out nicely. 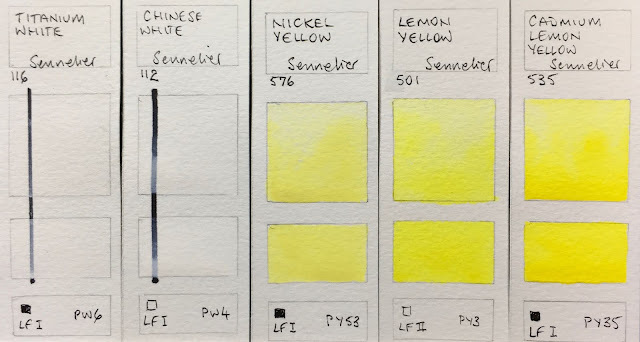 Sennelier L'Aquarelle professional Watercolours - Titanium White, Chinese White, Nickel Yellow, Lemon Yellow, Cadmium Lemon Yellow. The Indian Yellow is warmer than it looks here. 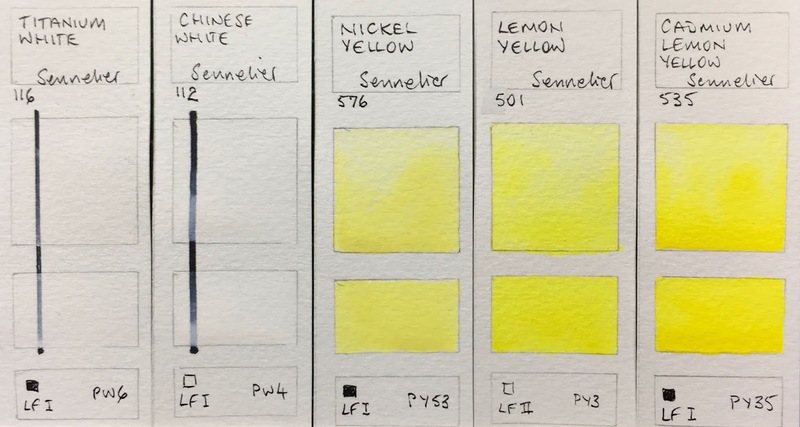 Sennelier L'Aquarelle professional Watercolours - Aureoline (not a recommended pigment). 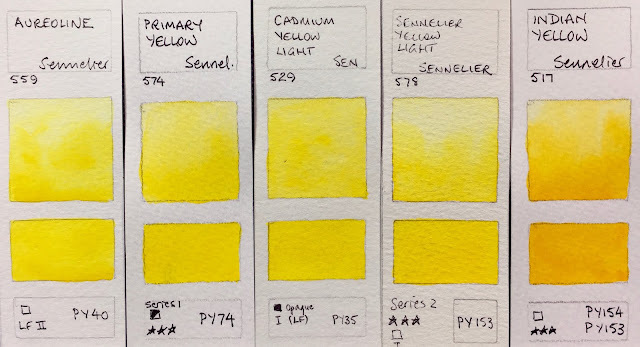 Primary Yellow, Cadmium Yellow Light, Sennelier Yellow Light, Indian Yellow. Sennelier L'Aquarelle professional Watercolours - Yellow Lake, Naples Yellow, Yellow Sophie, Naples Yellow Deep, Cadmium Yellow Deep . These warm yellows and oranges are lovely. 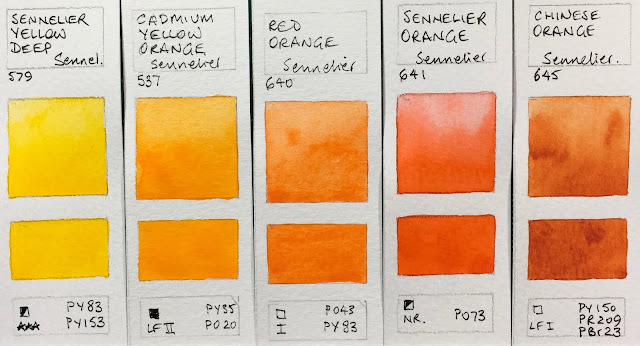 Sennelier L'Aquarelle professional Watercolours - Sennelier Yellow Deep, Cadmium Yellow Orange, Red Orange, Sennelier Orange, Chinese Orange. There are some gorgeous bright warm reds in this range! 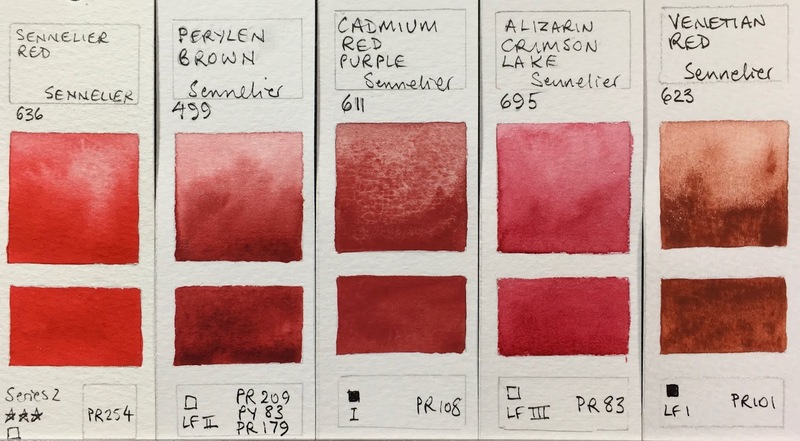 Sennelier L'Aquarelle professional Watercolours - French Vermilion, Scarlet Laquer, Rose Dore Madder Lake, Bright Red, Cadmium Red Light. Rose Madder Lake is the colour usually referred to as Quinacridone Rose or Permanent Rose - a great cool red option, hough Carmine is the same pigment and also very pretty if you want a slightly more crimson option..
Sennelier L'Aquarelle professional Watercolours - Alizarin Crimson (this is a permanent hue), Carmine, Crimson Lake, Quinacridone Red, Rose Madder Lake. Sennelier L'Aquarelle professional Watercolours - Sennelier Red, Perylen Brown, Cadmium Red Purple, Alizarin Crimson Lake (not recommended due to poor lightfast rating of this pigment), Venetian Red. Sennelier L'Aquarelle professional Watercolours - Opera Rose, Cobalt Violet Light Hue, Permanent Magenta, Cobalt Violet Deep Hue, Red Violet. Sennelier L'Aquarelle professional Watercolours - Helios Purple, Blue Violet, Dioxazine Purple, Prussian Blue, Indigo. The French Ultramarine Blue is a two pigment mix so go with the Ultramarine Deep if you want a single pigment Ultramarine. 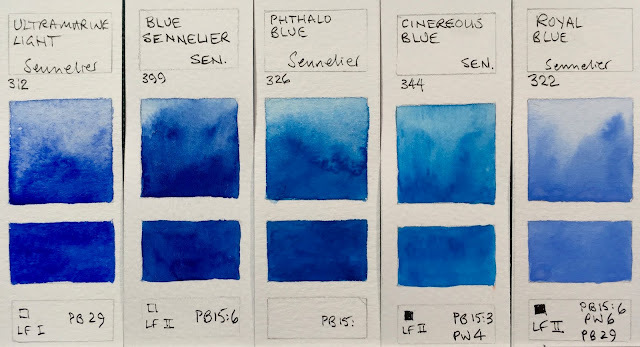 Sennelier L'Aquarelle professional Watercolours - Blue Indanthrone, Cobalt Deep, Cobalt Blue, Ultramarine Deep, French Ultramarine Blue. 'Blue Sennelier' is often referred to as Phthalo Blue Red Shade. It's unusual to see a Cerulean made with PB28 rather than PB35 or PB36. Sennelier L'Aquarelle professional Watercolours - Cerulean Blue, Cerulean Blue Red Shade, Turquoise Green, Cobalt Green, Phthalo Turquoise. There isn't a single pigment Phthalo Green PG7, but the mixed pigment Viridian is a rather nice option. 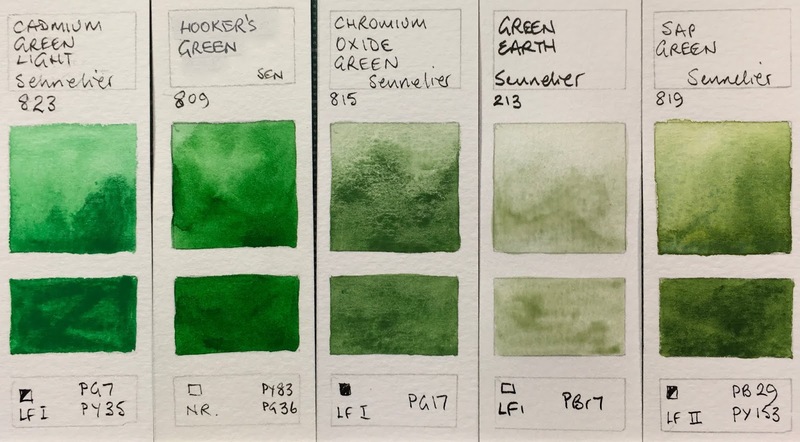 Sennelier L'Aquarelle professional Watercolours - Forest Green, Phthalo Green Deep, Viridian, Emerald Green, Sennelier Green. Sennelier L'Aquarelle professional Watercolours - Olive Green, Phthalo Green LIght, Bright Yellow Green, Brown Green, Brown Pink. The Quinacridone Gold is a nice version, even though a three pigment mix. 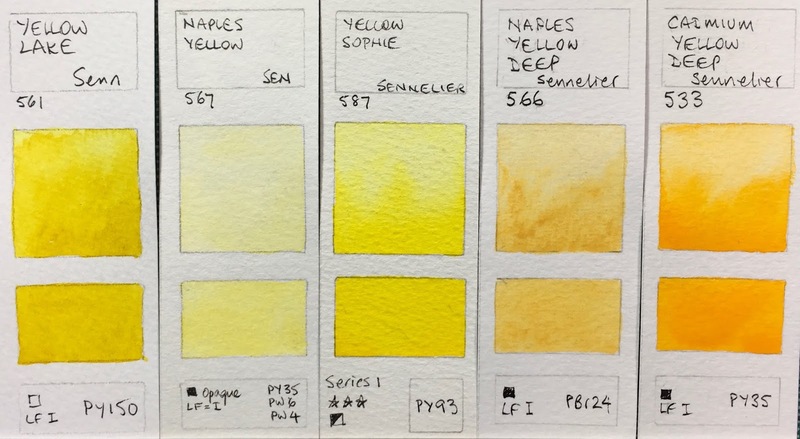 Sennelier L'Aquarelle professional Watercolours - French Ochre, Light Yellow Ochre, Yellow Ochre, Gold Ochre, Quinacridone Gold. I'm always happy to see a PBr7 Burnt Sienna. Caput Mortuum is like a deep Indian Red. Sennelier L'Aquarelle professional Watercolours - Burnt Sienna, Permanent Alizarin Crimson Deep, Caput Mortuum, Payne's Grey, Neutral Tint. 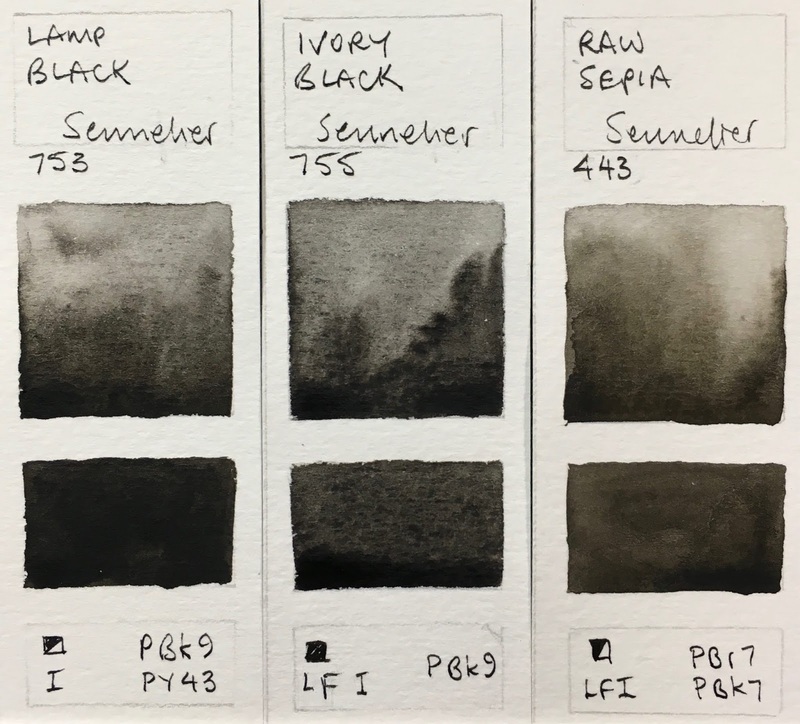 Sennelier L'Aquarelle professional Watercolours - Van Cyck Brown, Warm Sepia, Raw Umber, Raw Sienna, Burnt Umber. Warm gray almost looks like Buff Titanium. I notice their Rose Madder is PV19 but they don't call it "hue". Thanks for the info about the honey. I bought some half pans from Greenleaf and Blueberry and they use honey in their paints. I'm not that familiar with honey as an additive as Daniel Smith doesn't use it. I did notice that the samples I painted were taking a while to dry. I think this might make my small set really good for Plein Air since the paint won't dry quite as fast. They colors lend themselves really well to landscapes so I'll be taking it out at some point. 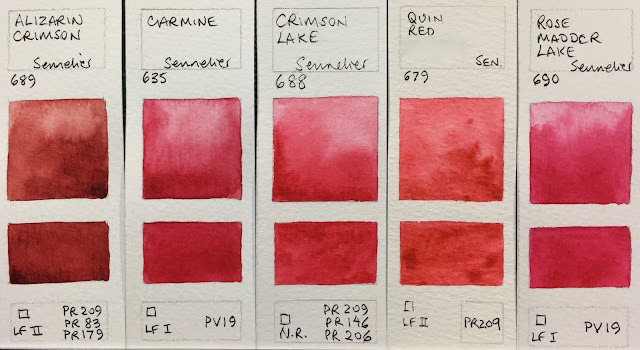 They don't refer to any as a hue, though the Alizarin Crimson is also a hue. Yes the Warm Grey is very close in colour to Buff Titanium but without the gorgeous granulation. Still, for those who can't get hold of DS and want that lovely ecru colour, it's nice to know there is a convenient option available. I resist honey in Australia - it does seem to cause some problems and can even attract bugs. I haven't tried the Greenleaf and Blueberry paints but would like to at some stage. However I think it's time to try making my own watercolours next...without honey. Have you tried the student set from sennelier/compared them to the artiste set? I have the chance to purchase the la petit tubes in 24 colors for a good price but an doubting to do so because of quality shifts... go for it or is it wise to save up to get the artist quality? any thoughts? I haven't tried the student sets from Sennelier. I am concentrating on artist quality so I can explore the varied characteristics of the pigments. Student sets tend to be far more homogeneous. I always think it is better to use artist grade if possible as the colours are more highly pigmented and easier to work with. Honey doesn't automatically mean drippy paint, it's all about the amount you use. I happen to really like it, so I make my own paints with enough that they're slightly tacky, but still solid in the pan, they definitely aren't runny. I carry a tin of them in my purse absolutely everywhere and I've never had a mess. So if you do make your own paint and want to try a honey formula, you can still reap the benefits without the drawback of sticky paint, just use less honey and more glycerin. I've never had a pest problem with mine, but I also use clove oil as a preservative, perhaps that helps keep bugs away. Good point that honey doesn't necessarily make paints runny. I have yet to make my own properly - I tried a little using some gum Arabic, a touch of clove oil and distilled water. Certainly the MG and Sennelier tubes I have tried have been too runny for our humid climate. Do you find you need to vary the proportions depending on the pigment? Watercolour is a tricky beast and I understand each pigment needs different treatment! What proportions have you been using? My formula for earth colors is 1 part gum arabic to 2 parts water, and about 1/2 part humectant, which can be glycerin, honey or both. Then maybe 1/4 to 1/2 tsp of clove oil to about 24oz of liquid medium. I might overdo it a little on the clove oil in those amounts, but it seems to do the trick. Synthetic colors are trickier, I'm still figuring out proportions for some Pyrrole and Quinacridone colors I've got. I have used your blog for just about all of my paint buying needs for a while now, thank you for creating such a thorough guide to paint colors! Have you gotten to try any of the Armenian earth pigments from Agulis? I don't think I've seen those colors on your blog yet, and some of them are very interesting. I have a few, Augite Porphyry Violet and Mummy Red Light, which I think might just be the brightest earth orange I've run across so far. 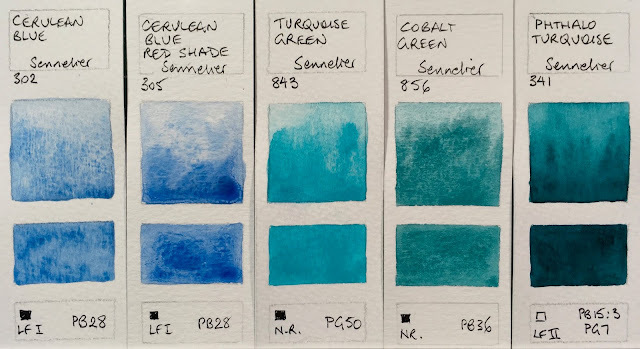 If you've not gotten to try them yet, I have some paint I've made from them I could send you, or if you're getting into paint making I would be glad to mail you a spoonful of the raw pigments if you're interested? I was making less than a half pan just to try the colours so was not really worrying about proportions - will do when I make my own paints later this year though! I like the honey base of sennelier and here is not very runny because in Portugal the climate is dry enough. The colours are very intense but I think that they could have done a better job in the lightfastness of most of their colours. Fun fact about brown pink! Turns out it was originally derived from buckthorn berries, also called "Dutch pinks." I also want to thank you for taking the time out of your life to tell us about your watercolor discoveries. I've just stumbled upon it, and I must say, I'm an instant fan. Thank you so much for this wealth of knowledge, Jane. It is truly wonderful to a new watercolorist like me. I live in Arizona, US and love the Sennelier paints for use in the hot, dry desert. I've never had trouble with them being runny or not drying. I paint slowly and my original paints just dried too quickly for me. Jane w8hing ypu a speedy recovery and big fun at PT! I had a small surgery on my dominant hand last year and became quite decent at drawing with my other hand in a very short time. Do give it a try, I actually th8nk it helps your brain and dominant handed drawing later. If I am looking at the right set, it contains Lemon Yellow, French Vermilion, Alizarin Crimson, Carmine, Dioxazine Purple, Ultramarine Deep, Phthalocyanine Blue, Forrest Green, Phtalo. Green Light, Burnt Sienna, Payne’s Grey, Warm Sepia, Naples Yellow Deep, Bright Red, Venetian Red, Cinereous Blue, Raw Umber and Ivory Black. It's rather short on yellows - there isn't a warm yellow or a raw sienna or a yellow ochre. So start with the lemon yellow, add a touch of bright red (a really small touch - just to create a mid yellow) then add burnt sienna to gradually create a neutralised warm yellow. That's my best guess. In this case though, I think is is worth getting the Quin Gold as a full pan to add to the set to fill a gap. ps quin gold is worth stacking on any palet. But then again that's just my own addiction. here is a low budget tip. 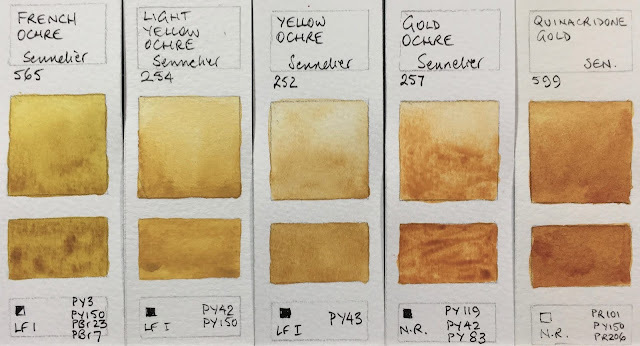 I know the white night paints are different,but I really like the white nights deep gold and their deep rich yellow. I use it for practice all the time. In europe they retail in single pans, not sure if they do in australia as I am not familiar with your options in the big down under. White Nights are available in Australia from Larrypost.com.au for AU$4.95 each I think. My husband and I recently went to Paris for a week to celebrate our 25th anniversary. While there I made a pilgrimage to the Sennelier mothership. It's tiny and very crowded and the woman behind the counter was frantically trying to help everyone. I asked her where the watercolors were and she handed me a battered hand-painted color chart, a scrap of paper, and a pencil. I chose 3 colors and wrote them down with the color numbers and color names in French. She looked so happy when she saw what I wrote. The watercolors were behind the counter in what looked like an ancient apothecary chest and they must have been organized by number. She held up a 10ml tube. I shook my head and said le grand, s'il vous plait, so she gave me the 21ml tubes. She also gave me a free bamboo brush roll for my patience which was very kind, but really, I'm in Paris, at Sennelier, and I'm going to be in a big rush to get through this experience? Mais non! I was very proud I did this all in French, despite being from Kansas. The Sennelier store is across the street from the Louvre. I recommend it for art lovers if you happen to be in Paris. Loved the idea that Cézanne and Picasso too squeezed through the narrow entrance to Sennelier to pick up a few supplies. I also think much of the first floor hasn't actually changed in 100 years. The sales people wrap everything individually which is why it can take some time trying to pay, a bit like shopping at a busy market stall on a Saturday morning. What a lovely story. I'll add the shop link to the post. It sounds like the lovely London L. Cornelissen and Son shop, which is an absolute joy to explore. I am so grateful for such a detailed post.This helped me immensely while ordering individual colours online. What a great guide!Thank you again. Does anyone know what is used in the Bright Red? Obviously it is something without a CI number but I'd still like to know what it is and having trouble finding out. PR 254 and PO 43, as I've just read in a wetcanvas entry. Thank You very-very-very much for all Your color charts. So enormously helpful! Thank you for the link to Camel watercolours. I haven't tried them but I'll leave the link there in case other readers want to follow up. I found this post when trying to figure out what makes this paint different from M. Graham. 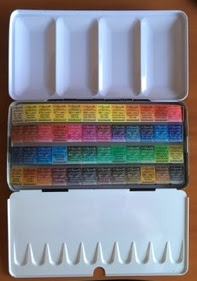 I have 1 tube and a small 8 color half pan set from Sennelier. Maybe it is an American thing but I'm used to using tubes and just dab out small drops of whatever color I need on my palette and squeeze out larger portions of the primaries/ most used. When I try my pan set I tend to freeze up and start being more obsessed with trying to keep the paints clean and frustrated when I end up tainting them by getting other colors on the pans. But I don't have this concern when it comes to what I've squeezed out of the tube sets. It is interesting all the comments about the stickiness of honey being a disadvantage, but in the Midwest when winters get dry, the honey mixes don't shrink and flake right off the palette like other paints. I like that they also work well with watercolor grounds/ have good adhesion. I'm curious about this brand, though seem to have ended up with M. Graham and Daniel Smith for about 90% of my watercolor paint collection. 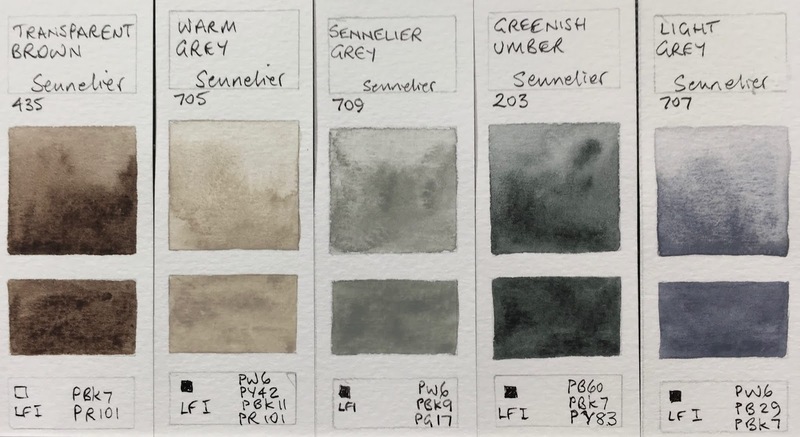 I live in a humid city where we use minimal air conditioning so honey-based watercolours are inclined to develop mould if you are not careful. A dry climate (or a dry studio) wouldn't have this problem. I think the Sennelier and the M.Graham are probably quite similar to work with. Thank you for finishing the chart. Testing all colours and Senneliers are got the right properties for my taste.